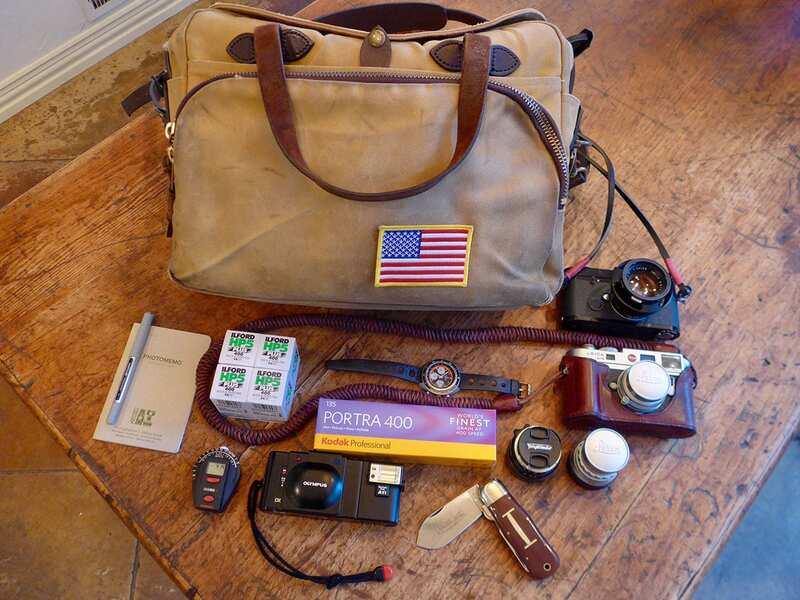 Jess, a photographer from Canada has put together a lovely bag shot for us all today. 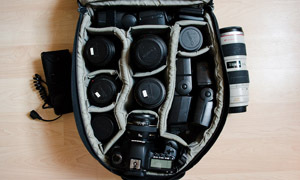 This really is a pro gear bag with only the essentials. Come and see. The bag I use is a Lowepro Mini Trekker Classic that I’ve had for about 7 years now. I should probably upgrade it to something with wheels and a handle but since its mainly for storage it works great. 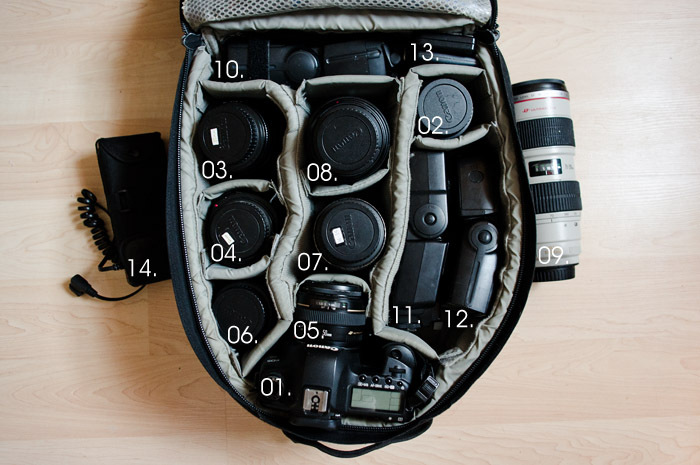 I also have a ThinkTank Retrospective 10 which ends up being my every day camera bag. 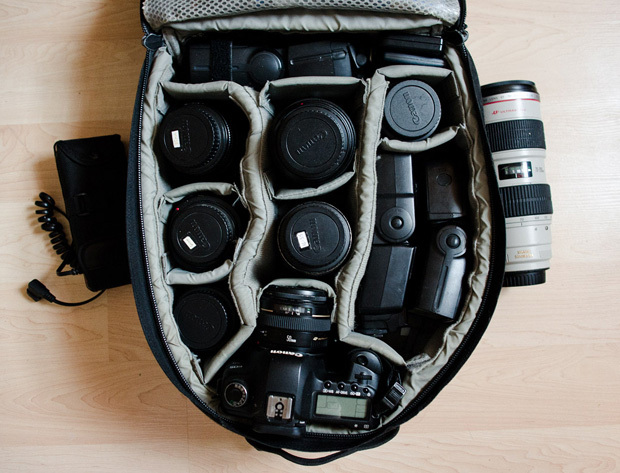 It doesn’t hold nearly as much stuff but I load it up with only what I know I am going to use for a specific shoot. Since a lot of the lenses overlap in focal lengths it mostly comes down to whether or not I want to use zooms or primes. Ok now onto the fun stuff. 01. Canon 5D MkII with Canon BG-E4 Battery Grip – This is the primary camera body that I use for most of my photography work. I have been debating on whether or not I should upgrade to the 5D MkIII recently. I don’t know if the MkIII is really that much better than the MkII but I have had this camera for a few years now and it gets a lot of use so I worry about it breaking down on me in the middle of a shoot. 02. Canon 28mm f2.8 – I got this lens because I wanted a lightweight wide angle lens when I didn’t feel like hauling the 16-35 around with me. 03. Canon 35mm f1.4L – This is one of the lenses in my bag that gets the most use. I enjoy shooting with primes whenever I can and the wide aperture really gives me a lot of flexibility in low light situations. 04. Canon 50mm f1.2L – Until recently this was the other lens in my bag that got the most use. Unfortunately there is a focusing issue built into the design of this lens so I decided to buy a Canon 50mm f1.4 to use as well so I can decide which one I prefer. 05. Canon 50mm f1.4 USM – I got this lens a few weeks ago to potentially replace my Canon 50mm f1.2L. I am going to use both of them for a while until I decide which one I prefer. 06. Canon 85mm f1.8 USM – As I mentioned before I prefer to use primes whenever I can and the 85mm f1.8 is usually the lens I go to whenever I need something longer than 50mm. I tend to shoot a lot of things with wider lenses so this one doesn’t get used nearly as often as the 35mm or the 50mm but it still sees a decent amount of action. 07. Canon 16-35 f2.8L – I use this lens a lot when I am shooting events and its usually closer to the 16mm end of the zoom range. 08. Canon 24-70 f2.8L – In certain shooting situations I find it to be a bit of a hassle to switch lenses whenever I need to change focal lengths which is when I use this lens. 09. Canon 70-200 f2.8L IS – The first thing you will notice is that this lens isn’t actually in the bag. That is because I have a Lowepro lens case that attaches to the outside of the bag which lets me maximize my storage space. Out of all the lenses I own this one gets used the least. I tend to prefer to shoot using wider focal lengths but there are times when you need a good zoom lens and its nice to know its there waiting for me whenever I may need it. 10. Canon 580EX II – This is my main flash and it gets used quite often. Canon just released an upgrade to this flash called the 600EX-RT but I haven’t had time to read up on it yet to see if there are any actual benefits to upgrading so for now I will keep using this one. There is a removable strip of velcro around the head of this particular flash which I use to attach things like bounce cards or color gels. 11. Canon 580EX II – Until recently this flash was sitting in a box broken. It had an unfortunate encounter with someones shoe at a Comeback Kid concert and it stopped working. I had it repaired last week and now it will be used as my backup in case something like that happens again. 12. Canon 540EZ – Since this flash is an EZ model it doesn’t work in E-TTL mode with any digital cameras so I use this flash at events if I feel like I need some back lighting. Now that I have the second 580EX II this one probably wont see nearly as much use though. 13. Memory Cards – I don’t use any specific fancy memory cards. I never shoot so fast that the card can’t keep up with me and I’ve never had a card fail in the 10 years I have been shooting so I just make sure I have enough memory to get me through whatever I am shooting. Right now I have 3 8GB cards, and 5 or 6 4GB cards. I have been thinking about getting a 16GB card recently just to make things easier. 14. External Battery Pack – I got this really inexpensive external battery pack in eBay and it works with all of my flashes. It takes 8 AA batteries and plugs directly into the flash. In increases the recycle time but mainly it just gives you 3 times the battery life which is handy if you are shooting a long event and need lots of flash power the whole time. 15. Backup Canon 5D – This camera isn’t in the picture but I have a Canon 5D as a backup just in case anything were to happen to the 5D MkII while I am shooting. I also have an Olympus Stylus Epic 35mm film point and shoot that I use every now and then for fun as well as a Ricoh GXR with the 28mm lens module that I use for most of my street photography. 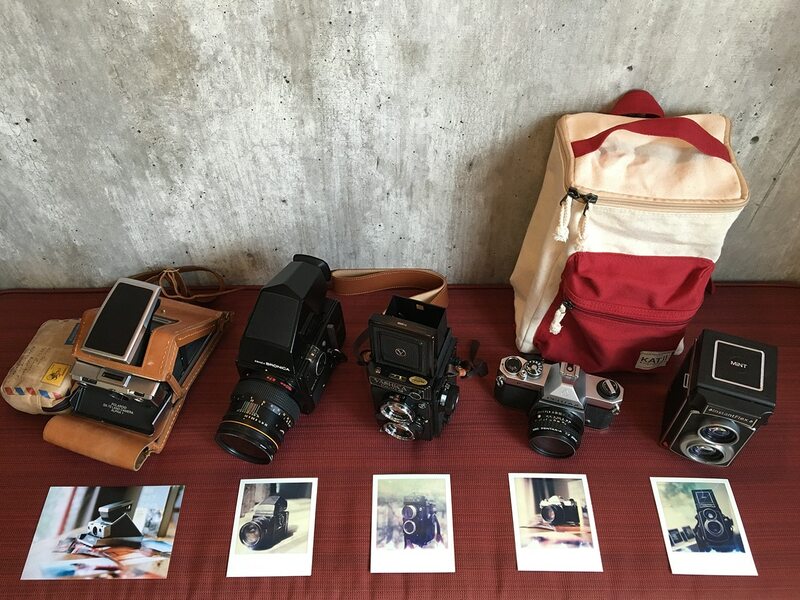 That about does it for whats in my camera bag. If you have any other questions feel free to ask away. Thanks for sharing your work bag with us Jess. 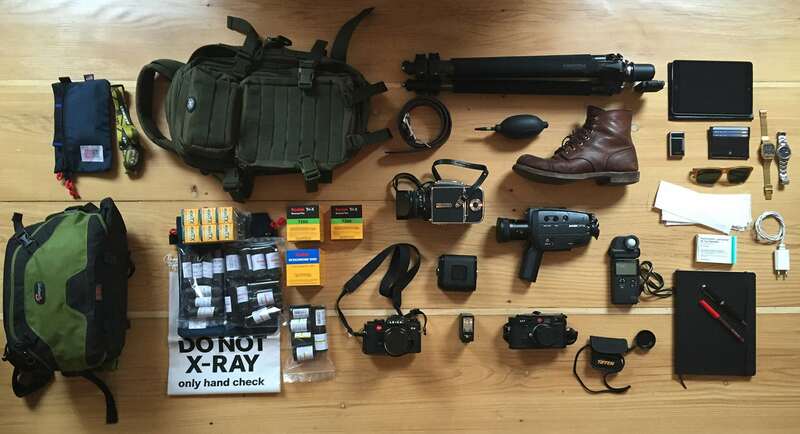 It is always interesting to see inside the bag of a working photographer. I have the same bag and almost the same contents. I typically only take two lenses though and I only use this for ‘serious’ photography where some external party demands a certain kind of photo within a short time frame. Otherwise, I shoot film from a compact or RF. Wow, that’s a lot of gear! How much does that weigh? 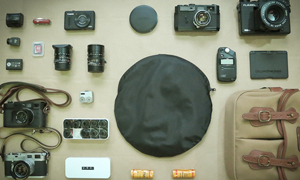 there is no focus issues with the 50L… been happy with it for 2 years so far.